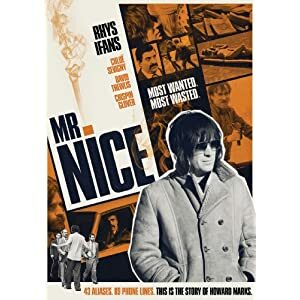 It’s unfortunate for Rhys Ifans, who turns out a terrific performance in this lightly dramatic biopic about the life and times of British dope smuggler Howard Marks (aka Mr. Donald Nice, among other names) that writer/director Bernard Rose (Candyman, Immortal Beloved) didn’t give him a more coherent story to take part in. It starts out promisingly enough – a few minutes in black and white before a young Marks takes his first toke, which instantly transforms the world into color. Clever. From here it’s fairly straight biopic fare, following the surprising twists and turns of Marks’ life as he goes from schoolteacher to small-time smuggler to one of the most-wanted men in England. For the most part, a strong sense of realism is applied, which keeps the movie from toppling over into some kind of “gangster” film. This is helped by the fact that Marks is presented as an extremely likable and easy-going character, which he comes across as in real life as well. The occasional use of dated footage (with Ifans added in) to show the time period almost feels interesting, but mostly just feels forced, considering that most of the movie is not shot in this way. The supporting cast is a mixed bag. As Judy Marks, Howard’s long-suffering wife, ChloÃ« Sevigny (“Big Love”) is hugely disappointing, mostly because she can’t seem to have been bothered to pick up a convincing accent. Crispin Glover (Alice in Wonderland), as an American dope dealer, is understated and unconventionally engaging in the way only Crispin Glover can be. And David Thewlis (the Harry Potter films) is crazy enough to be believable. I wasn’t especially drawn into the world that Rose created around Marks. Parts of it were interesting but there was too much fragmentation to ever really allow me to invest anything in the characters or the plot. No user commented in " Movie Review: Mr. Nice "